a glitch in the system. Significant and popular stock footages in Corbis Motion were migrated to GI for the past couple of months. Now, you have a more comprehensive and diverse library to explore. Corbis Motion closed its doors in May 2, 2016, but the migration was completed in the summer. Videos from popular media sites can also be found at Getty Images. They include contributions from BBC Motion, National Geography, Bloomberg and Disney. In addition to Corbis footage, you can also access and download videos from Getty’s collection. There are premium 4K videos, editorial films, and featured collections to help you find what you are looking for. You can also browse more collections from other media sites or popular categories in the stock site. Once you find the Corbis Motion videos you are looking for, you can easily buy them. You can get a Royalty-Free license or Rights-Managed license with them, too. Purchase the RF footage a la carte or on demand with Ultrapacks to save hundreds of dollars. If you need exclusive rights, RM is the best option for your purchase. So, is Corbis Motion really gone? No, the videos were just transferred to a new home. Getty Images has been in the industry for two decades and has the largest stock collection at the present. If you are looking for quality and variety, you will find them here. When it comes to stock photos, users always look at the price per image or the subscription rates. That is why they always look for the cheapest stock photo site in the market. Some have actual budget constraints, while most simply want to spend on more important things such as marketing. They use these images to enhance their reputation through remarkable bran representation. Of course, images from cheap stock images are not of inferior quality to expensive ones. In fact, they are roughly the same. Finding the cheapest stock photo agencies takes time and research. A lot of websites promise very cheap stock images but not all of them live up to their promises. Some fail with the quantity, while others flop with the quality. Thus, you should never invest with any website that offers either than. Select a photo site that offers both. To spare you the trouble of finding the cheapest stock photo websites, we took the pleasure to enumerate them for your own convenience. 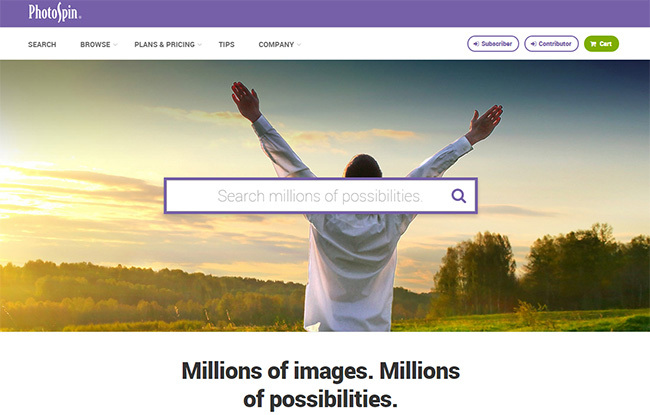 These websites feature both great quality and quantity images. Here is a list of very affordable stock image sites and their features to give you an insight of what they offer and how much they cost. We hope that this will help you find the right image source for your creative needs. With Photospin, you can get images for as low as $0.01. Yes, that’s right! That’s the cheapest price you can get for high quality images, illustrations and graphics. Photospin has over 2.5 million images in its library. It may not be as much as other websites, but it offers them for the cheapest price. Besides, that much of a library is still large enough to fill your needs. Depositphotos is one of the most popular stock image banks in the market. It offers high quality images for as low as $0.10 per piece. It even offers a free trial for 7 days to newly registered users, allowing them to download 35 free stock images or 5 images per day for 7 days. It also offers subscription plans, where you can save more. This stock photo site is surely worth checking out. 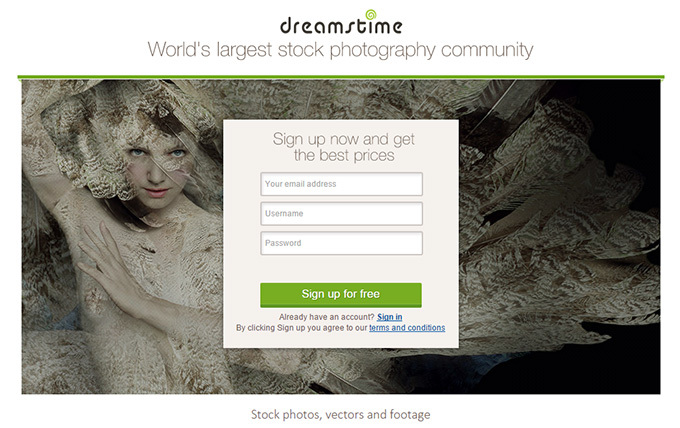 Dreamstime offers its stock images for $0.20. 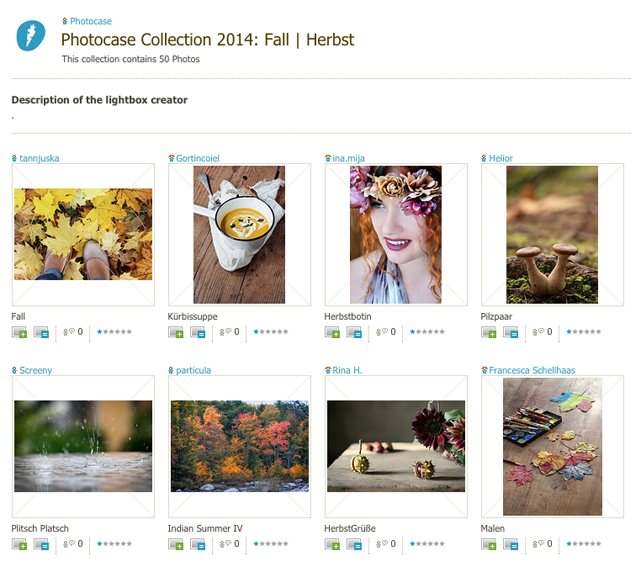 Like other stock photo websites, it also offers a free photo gallery upon registration. The website offers their royalty-free images for very flexible prices. You are conveniently directed to the image section where you can download images for as low as $0.20 with your very own payment option. There are many stock photo agencies out there that also offer cheap stock photos. There is Shutterstock, iStock and the newest addition by Adobe: Adobe Stock. 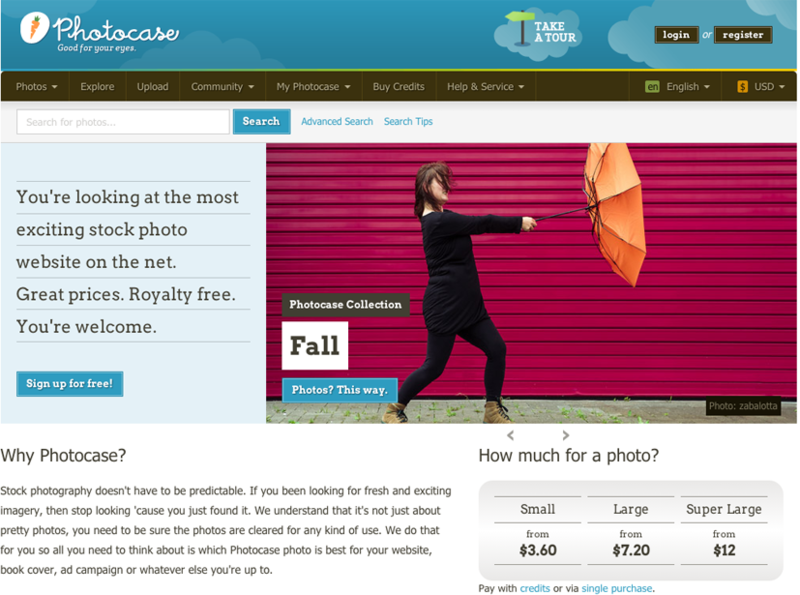 If you are looking for the cheapest stock image site, these are worth checking out! Photocase, a German-based site that collects creative stock photos, made available by a dedicated community, began in 2001. This allowed people to buy authentic cheap stock photos from people who were invested in finding and sharing creative stock photos. In this Photocase review, you will learn about how to find and buy authentic stock photos and what separates Photocase from the competition. Over a decade of users uploading to and downloading images from this site has led to a modest but dedicated base of users who regularly find themselves in need of stock images. While noted in any number of Photocase review postings and articles, the collection isn’t as expansive as those offered by more corporate-focused stock image hosts which can turn some away. I found the StockPhotoSecrets review on of the best, but wanted to have my own one here. But the structure here is so unique that those who frequently use stock images may find themselves unable to turn to another site once working with this one. Standards by which images are selected differ greatly from rival sites. The art of photography is very much a focus in Photocase and the focus of potential commercialization–matching images to any number of industries’ standards. Uploaders, when their images are accepted, are given credits towards downloads of other images available. Income can also be earned by the download from other users, but this occurs when these downloads are not bought on the currency of credited awarded to contributors. So while the earning potential may be low with co many contributors being the same to download from other users, there is still a wealth of artistic imagery to be used. And this collection may only be on the rise, as the number of contributors remains small, these same people are dedicated to collecting and sharing unique images in this small community. The focus of images collected here is on the unique and what could be deemed artistic in nature. These aren’t necessarily the same kind of photos found on the cover of major magazines but will appeal to photographers, graphic designers, and photo enthusiasts alike. Purchasing of images can come from credits earned through community interaction, debit, credit, and various methods of PayPal invoices. While the offerings may be appealing, and the community of contributors intimate, the offset is in the pricing of images. Users may find themselves paying more for the image here than they have at rival sites. Some single images can range from €10 to €20, and that’s not considering factors like size and whether or not images come packaged with others, which can up the price as high as €70. For many, the use of credits will be more appealing than paying the exorbitant rates, thus ensuring a self-sustaining library of images to be used and shared amongst the community. Contributors can earn 40% to 60% of their contributed images, and even in credits this can lead to purchasing power rather quickly. The issue of licensing is a big one with those who use stock images. It almost never seems clear as to when and where an image can be used without stepping on the toes of the original distributor of the image. But here users will find detailed guides on how licensing works, highlighting how images can be used and in which markets they can be accepted, along with where and how to credit the author of the image and how to purchase exclusivity to an image making a credit unneeded. They will have options to royalty-free licensing, requiring only a sourcing credit for limited runs up to 250,000 prints. There are also extended licenses that give the purchaser rights for unlimited prints and the rights to reuse images in reprints. Determining the quality of the site relies heavily against the user who intends to use it and their needs of stock images. for those with an international audience they are trying to reach with a marketable appeal to rival that of fashion magazines and sites, a different site may be more to their liking. For the artistically inclined who want to capture people’s attention with stand-out images or brand with uniqueness, they’ll find a home here.